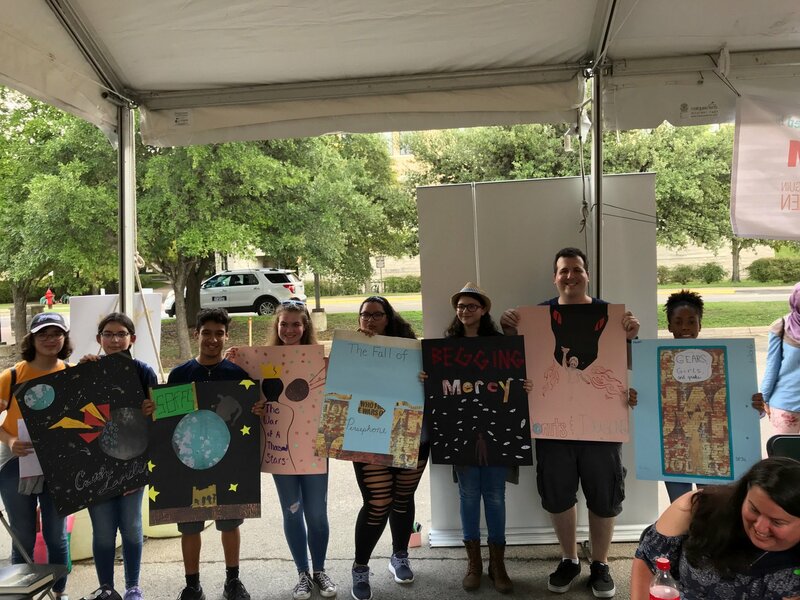 Last Saturday, thousands of readers from all over Texas celebrated the 10th annual Texas Teen Book Festival at St. Edwards University in Austin. 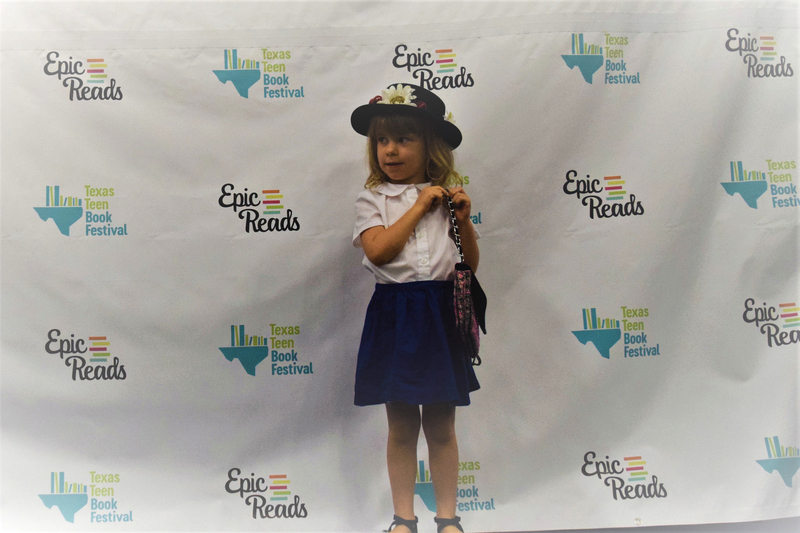 As I wrote last week, the months leading up to the event are filled with planning meetings, emails, and spreadsheets, as BookPeople, the Texas Book Festival, and our dedicated team of librarian volunteers put everything in place. Once the day arrives, though, there’s nothing left to do but let it all happen and enjoy the show. We did have a few uncertain moments when we decided to enact our rain plan for the first time, but the show must go on, and it was great! We kicked off the morning with an exclusive roundtable discussion for our We Need Diverse Books Essay™ Contest winners, all of whom wrote thoughtful essays about “The hero I want to see…” These lucky young writers got to sit down with authors Julissa Arce, David Levithan, Tochi Onyebuchi, and Cynthia Leitich Smith along with Brenda Conway from Random House to ask questions and share thoughts about writing and publishing and the power of representation. One of my personal favorite moments of the day came when Julissa Arce realized that a number of the winners were from her old high school in San Antonio. They couldn’t have been more delighted. Then we all headed to the gym for Nic Stone’s powerful and forthright keynote about sexuality and individuality and the complexity of figuring all that out—no matter how old you are—before launching into a day of programming that featured over 35 authors, panels, keynotes, workshops, and day-long programming in our interactive tent. Listening to Neal and Jarrod Shusterman talk about the truly terrifying research they did for Dry in their afternoon keynote was especially fascinating. 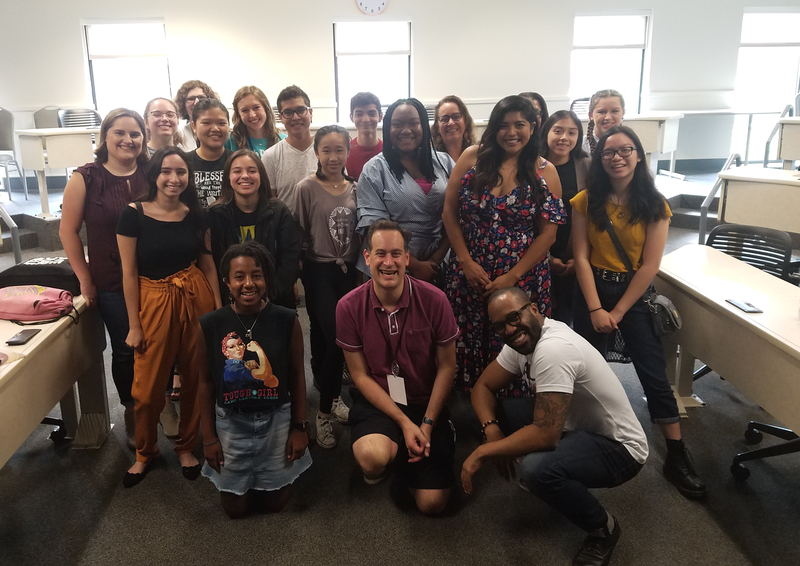 Shawn Mauser, TTBF Director: I loved seeing how excited the WNDB essay winners were to have that special time with Cynthia, David, Tochi, Julissa, and Brenda. The look on their faces when the authors started walking in absolutely made my day and gave me goosebumps. It was powerful to see the kind of impact our fest is capable of having. Shannon Brewer, TTBF Interactive Programming Coordinator: The Epic Reads Costume Contest is all about bringing favorite book characters to life. Usually the event is filled with teens and adults, so imagine when this EPIC 4 year old marched up on the stage in all her sassy glory and announced into the microphone with a British accent, of course, that she was Mary Poppins! I wondered if the adorableness was cheating, but our audience proclaimed it no such thing. She ended up not only winning Best in Show but also having a line of adoring fans waiting to take a picture with her when the costume contest was over. Jen Bigheart, TTBF PR Director: Beth Revis, Adib Khorram, Julie C. Dao, Richelle Mead, Tochi Onyebuchi, and Natalie C. Parker gathered for the ultimate Cover Design Challenge sponsored by Penguin Teen. Seven teams of seven gathered under the interactive tent to create their own book cover design, book synopsis, and title. Authors walked around to each team offering their expert advice. After thirty minutes of creativity, the team captains lined up with their proposed designs. The winner? Donuts and Dragons! Julie Wernersbach, Texas Book Festival Literary Director (and TTBF Balloon Wrangler): One of my favorite moments was at the end of Ngozi Ukazu’s graphic storytellling workshop. All the kids were gathered around her, beaming, totally enthralled by her hands-on talk about drawing, art, and storytelling. 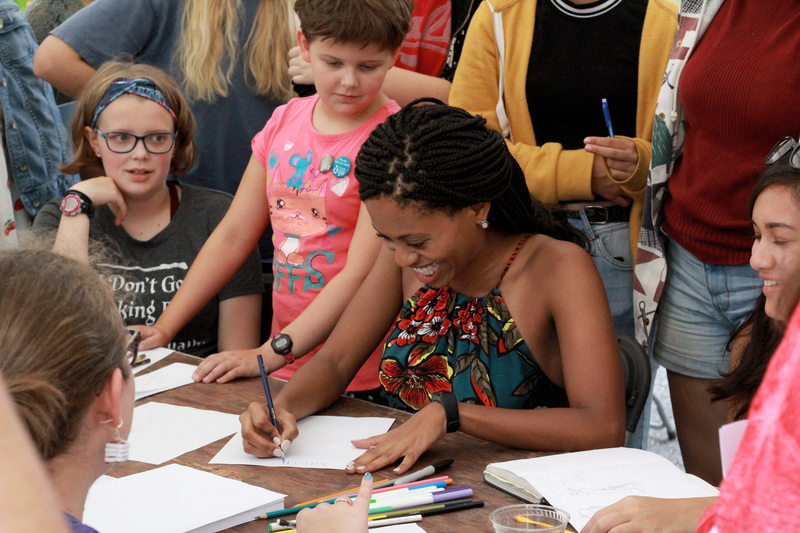 Seeing the kids connect with her in the moment and recognizing that the light in their eyes was the excitement of knowing that writing and drawing was something they could do, too, was amazing. It made my day. 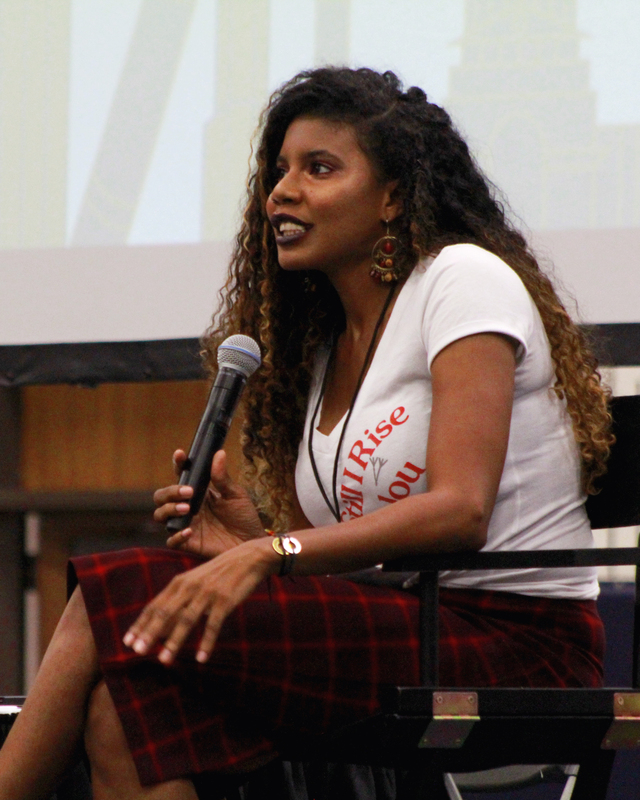 Ivy, BookPeople’s Teen Press Corps: I loved being able to watch Ngozi Ukazu draw the crazy story that the crowd came up with. If you told 13 year old me that one day I’d get to lean over the shoulder of the creator of Check Please as she drew a professional jump-roper with purple hair, I’d never have believed you. But TTBF makes cool stuff like that possible! 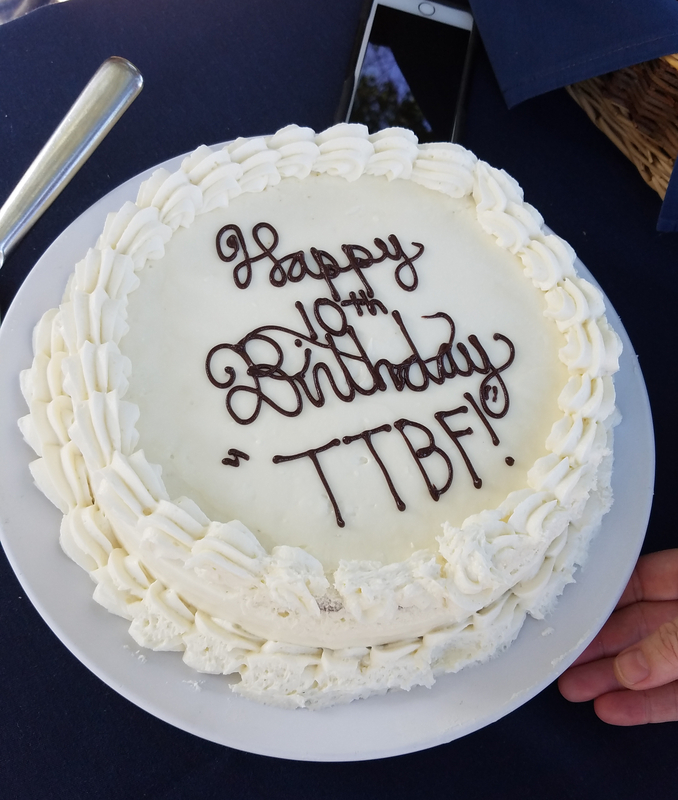 After a full day, we capped everything off with some well-deserved birthday cake, and called an official wrap on TTBF 10! (Don’t worry, we had a bigger cake too.) Thanks so much to the authors, moderators, volunteers, Texas readers, exhibitors, sponsors, and everyone who participated in this memorable day. And I want to add a particular thank you to our presenting sponsor HEB, which is not only the best grocery store in Texas, but an incredible ally in fostering a curious, literate, passionate community bound by books. This entry was posted in Uncategorized on October 12, 2018 by Meghan Dietsche Goel.